"I used to be into video games during the PS2 era," Benny Her says, as he buys a green tea espresso at convenience store in Osaka's fashionable youth district, Americamura. "But then I started apprenticing and didn't have any free time." That apprenticeship was a huge gamble. And Benny Her didn't look like a gambler. He looks like a guy I knew in college—comfortable clothing and puffy hair. And when he pulled up on his pink bicycle, wearing an anime sweatshirt and carrying a messenger bag, he could've easily passed for a foreign exchange student, maybe studying to get a masters or a PhD. Benny is a student alright, he's committed to get a doctorate from the school of hard knocks in Japanese tattooing. And so far, he's emerging as one of the Japan's most promising—and daring—tattoo artists, aiming to take tattoos to the country's geek masses. Public baths, swimming pools, and even hot springs prohibit individuals with tattoos from using their facilities. In Japan, the connection with tattoos and organized crime is still strong—even through there was a Western style tattoo boom at the turn of the century that tried to separate itself from traditional ink. The country has a long tattooing history, but it's not necessarily a proud one. Tattoos have existed in Japan since way before the birth of Christ, but it wasn't until the Edo era (1600-1868) that they began to be used on a decorative adornment much like today. As Japan opened itself to the West during the Meiji Era (1868 to 1912), tattooing fascinated Westerners who visited Japan. Along with topknots and carrying samurai swords, the Meij Government banned tattoos as old-fashioned relics that would impede modernization. It wasn't until after World War II that the U.S. Occupational Forces decriminalized tattoos. Yet, by that time, tattooing has become something that covered the backs of Japanese yakuza. "There's this notion in Japan that tattoos are only for yakuza and not for regular people," says Benny. "It's a sad stereotype." Yakuza still get elaborate tattoos—some of Benny's customers are yakuza. But regular Japanese people cover their bodies in hidden tattoos, too. "All my customers are good customers," he adds. "No matter who they are, I treat them with respect, and they do likewise." While he comfortably navigates Japanese traditional tattoo culture, he's also hoping to help it expand like it never has before. Then you look at his bulletin board, covered with drawings of tattoos he's done or will do—there are anime heroines like Rei Ayanami next to snakes, dragons, peacocks, and sumie style mountains. I compliment Benny on his art, and he genuinely seems flattered. The juxtaposition between the country's traditional and modern cultures isn't jarring, it's utterly fascinating. And that contrast doesn't stop on Benny's bulletin board: it's evident on Benny's living canvas of flesh, where dragon's and koi mingled with Takaya Noriko from 1990s sci-fi anime Gunbuster. Benny, who is 33 and now married to a Japanese woman, was first exposed to Japanese anime, like so many were in those dark, pre-internet days of the late 1980s and early 1990s: via a VHS tape that was being passed around. "It was a copy of a copy of a copy," he recalls. The tape was a mishmash of shows and movies, and it had some Macross on it as well as a movie that was just released in Japan. That movie was Akira. Benny's mind was blown—he had never seen anything like it. Benny, who described himself as the kid sitting at the back of the class drawing, immediately took to Japanese animation. Benny wanted to know more about the country that produced these wonderful images and moving stories. But studying Japanese at the University of Minnesota took an unexpected turn when his tattoo artist housemate asked him to translate for a visiting Japanese tattoo artist from Osaka. At that time, Benny had yet to get inked, and he thought it was cool just hanging out in a tattoo artist's studio, speaking rudimentary Japanese. It was the late 1990s, and tattooing was exploding in the U.S. It still had an edge to it; it still felt somewhat underground, especially to how mainstream it's become in the last decade. Benny visited Japan, stopping in Osaka and falling in love with the city, before getting an English teaching gig, which shipped him off to the boonies in Kagoshima in 2002. Benny felt like his future was in Japan, but just not necessarily in the teaching field. A chance encounter in Hiroshima with a tattoo artist named Hiderow convinced him of that. "His studio was unlike anything I'd ever seen—it had a huge TV running anime and all these anime figurines," Benny says, gesturing. "It totally went against stereotype." The studio was a mix of traditional Japanese art and modern day manga and anime creations. Hiderow, who tragically passed away in his late 30s, was a pioneer and one of the first to meld traditional and otaku motifs. It was that chance meeting during which Benny decided what he wanted to do with his life. He wanted to be a tattoo artist. "Look, I'm a shokunin," Benny explains. "Shokunin" (職人) is a craftsmen—an artisan. In Japan, craft is, and always has been, highly valued. Whether that be making swords or even cutting hair, apprenticeships can last years, with little to no pay. Instead of salaries, the apprentices are paid in experience and skills—and if they make it through their often-grueling apprenticeship, they are paid in loyalty. The apprentices then become master craftsmen, and the cycle continues. "Getting tattooed like this takes years off your life," he says. "All that ink has to go somewhere, and it goes to your liver." He adds that there, of course, are elderly tattoo masters, like Horiyoshi III—who no longer takes appointments, but recently did a peony on Benny's knee. Benny wasn't going into this half-assed. Though, he didn't know how long the apprenticeship was going to last. "I thought the apprenticeship was going to be a few months," says Benny, as he looks at one of his dragon sleeves—which was completed only recently. Full body suits can cost over US$10,000. Benny was burning through his money, and without a steady salary, he ended up on the street, homeless for just over a year. He was sleeping on rooftops and next to air conditioners. And when he got lucky, Benny would squat in random buildings. While he's sure that his employers knew that he was out on the street, Benny is quick not to lay blame. "I'm the one who begged and begged for this apprenticeship," he says. "I'm the one who didn't have a place to stay anymore—it wasn't their fault." Other apprentices could always crash at their parents' house, but Benny could not. He didn't want any special treatment—and already felt like he was getting it. "My Japanese isn't 100 percent perfect," concedes Benny, who speaks and writes fluent Japanese. "There are things I don't know—things my bosses and co-workers would let slide that they never would for others." And when things started to get really rough, other tattoo artists would bring him food. One tattoo artist at the studio, Wataru, finally decided to take Benny on as his "deshi" (弟子) or "student", working directly with him to help him become a tattoo artist. Benny's skills were improving, and the other tattoo artists were helping him get a tattoo machine and ink to practice on himself—and willing friends. And after four-and-a-half grueling years and over a hundred practice tattoos on folks for free, Benny was finally allowed to tattoo a customer. "Boy, the first time you tattoo someone...for money," he recalls, putting his feet up on a wastepaper basket. He was taking their money, and he wanted to be damn sure not to screw up and leave behind unacceptable work. And then there was the next customer, and the next customer, and the next. Benny was finally a shokunin—a craftsman. Across the yellow strip, in ornate, stylized script, it reads: "Keizoku wa chikara nari". On Benny's desk, underneath his sketches, sits his messenger bag. Across the yellow strip, in ornate, stylized script, it reads: "Keizoku wa chikara nari" (継続は力なり). Literally, it means "continuation is power", but it's often translated as "Whatever doesn't kill us, makes us stronger" or "Persistence pays off"—two English translations that Benny prefers. Benny's studio is spacious by Japanese standards, and he's free to decorate it however he likes. In the reception, two paintings Benny did of Noh masks hang. On the magazine rack proudly displayed, there's the current issue of Japan's biggest tattoo mag, which has an interview the American-born tattoo artist. His studio has autographs of the celebrities he's inked. 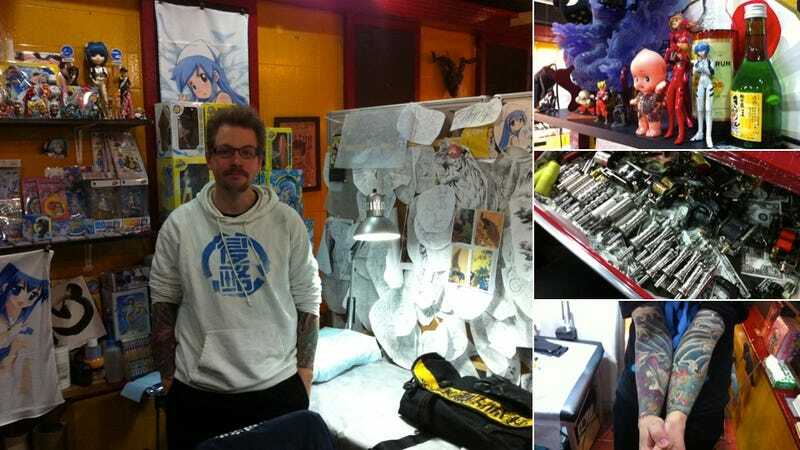 Though, Benny seems more excited talking about the Ika Musume stickers and t-shirts he makes for Comic Market than bragging about who he's inked—or just talking about the Japanese art of tattooing. For those who are interested in making an appointment with Benny, contact him via his website or Chopstick Tattoo. Benny is also hosting an 'Otaku X Tattoo' event in Osaka on Apr. 14; check his Twitter for more info.